Are you considering going paperless, but not sure of how a scanning service works? In this blog post, we offer an inside look at a professional scanning service. A scanning facility is a busy place with an assembly-line atmosphere. Preparation, sorting, indexing and imaging stations enable organized processing of documents by uniformed, screened scanning technicians. 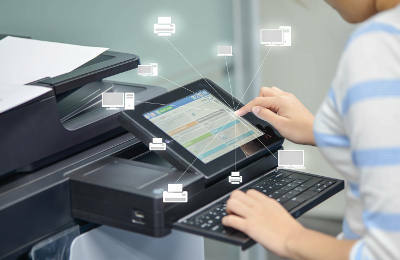 Multiple scanners of different sizes allow multiple, customized document scanning projects to occur simultaneously. Since the scanning facility handles confidential and sensitive documents, it must be secure. State-of-the-art surveillance systems record all activity, authorized visitors must show identification and sign a confidentiality agreement, and secure loading and unloading areas allow discreet delivery of documents to and from the scanning facility. The first step of a scanning project is preparing documents for imaging. All staples and paperclips are removed from files. Torn and dog-eared pages are repaired. A bar code separator sheet is placed within each file to create a verifiable record of which box it came from and link it to a database for the indexing phase. Imaging can only begin after each document has been prepared. The imaging phase of scanning involves converting paper documents to digital files. Each page of a file is fed into a high-speed scanner, which processes hundreds of pages per minute. Depending on your preference, your documents are converted into PDF, TIFF, PNG or JPG digital file formats. Each image is inspected as it’s scanned to ensure it meets strict quality control standards. If necessary, documents will be re-scanned. Following the scanning phase, each image is indexed at a workstation. The barcodes used during the document preparation phase are used to earmark, group and categorize your information to your exact specifications. Specialized optical character recognition (OCR) software is then used to make the text in your imaged documents searchable. By typing keywords and phrases, you can quickly find specific data within your digital files. Although quality checks are administered during every phase of a scanning project, a final verification ensures every document is captured, indexed and processed by OCR software. If not, the process is repeated. Depending on your business needs and retention requirements, your paper documents are shredded, stored or delivered back to you. When outsourcing the storage and/or shredding of your documents, make sure to choose a qualified, NAID AAA Certified provider. Depending on your preference, your digital images can be transferred to a portable hard drive, transferred by secure FTP, or uploaded to your document management or enterprise content management (ECM) system. Knowing how a document scanning service works helps you go paperless with confidence!